I finally got some quality time with the Laser Cutter at Milwaukee Makerspace, and I have to say, I’m fairly pleased with the results! 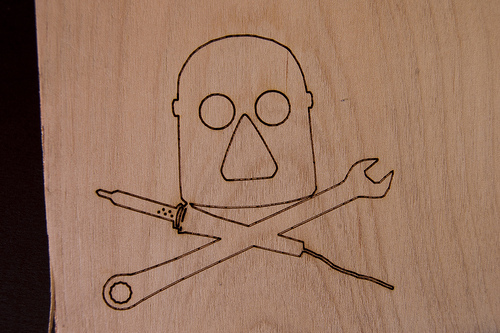 Once I had a DXF file, I was able to import that into CorelDRAW, which is what the PC that controls the Laser Cutter uses to do the work. There’s a bit of trickery in CorelDRAW between raster and vector artwork, but doing it this way with a DXF file at just one pixel wide seemed to force it to work in vector mode, which is what I wanted. 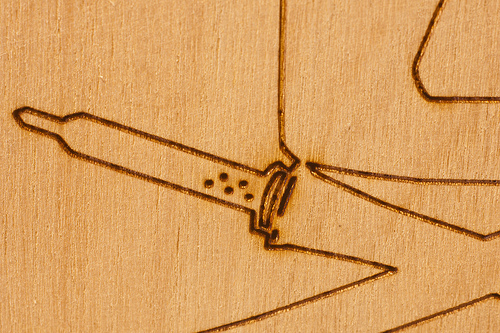 Here’s a close-up of the etching into wood. I ran it a few times. If you’re doing a vector cut, it just traces around the outline, and goes super-fast. If you are using raster artwork, it’ll behave like an old dot-matrix printer and go line-by-line and take forever. Shane did this Periodic Table and it took almost two hours. (It does look pretty amazing though!) I’m still not 100% sure what CorelDRAW does with each format. I tried to import an SVG file but it seems to convert it to raster format. 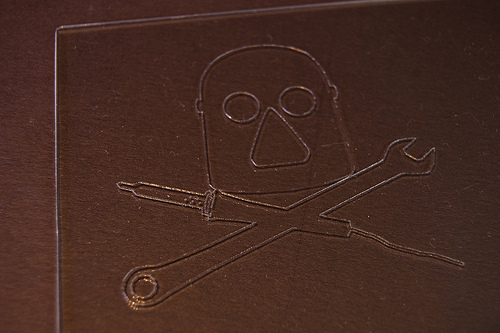 The DXF kept its vector format, so I’ll stick with that for now. 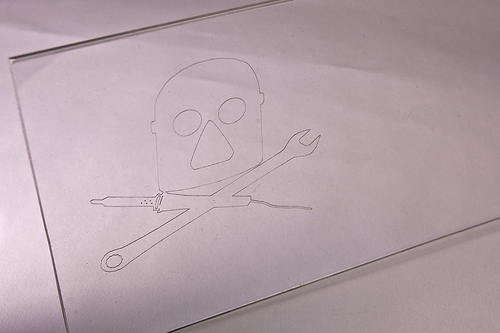 This is just an outline of the logo, but we should be able to use a filled-in logo (in raster format) and create the effect of frosted glass, and then we can do this Floating Glow Display project from Make with our laser-etched plastic. Hmmm, it looks like I just gave myself another project to tackle! Posted on Sunday, December 4th, 2011 at 10:13 pm. Subscribe to the comments feed. Both comments and pings are currently closed. Post on your own blog.